The Pedestal System is a unique substructure system designed for external raised flooring applications. Recommended for raised floors when creating green roofs, balconies, water features and terraces, the professional substructure system is widely used around the world in the building industry. Designed, manufactured and tested in Italy, the new Pedestal System is highly preferred by architects and builders for multiple reasons including ease of use, long term efficiency, durability and strength, ability to be recycled and reused, and visual appeal. 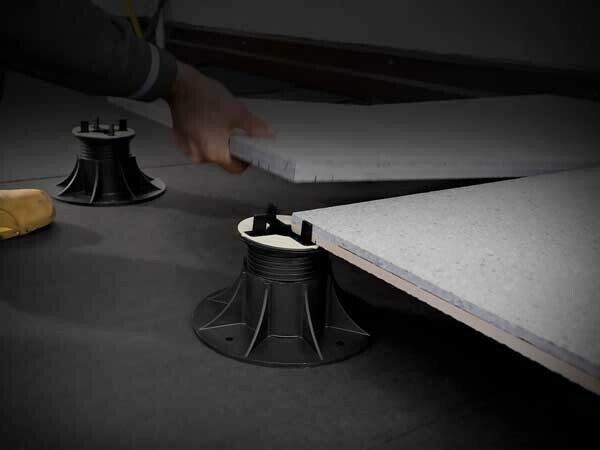 The adjustable supports for raised floors represent a particularly innovative feature in the high quality substructure system with self-levelling, anti-slip and noise reducing head in dual material. The Pedestal System is the only product on the market that's capable of reducing noise levels to as little as 25dB. Some of the advantages of the award-winning Pedestal System include design versatility allowing use with tiles, pavers and timber decking to create raised floors on green roofs, balconies, water features and terraces; capability to accommodate heights from 17mm-550mm, ensuring elegant, homogeneous paving each time without having to subject the building to radical structural work; and ability to eradicate problems of damp and water infiltration, accommodate cables or pipes, and allow quick, straightforward inspections. The Pedestal System includes a patented slope-correcting device, which compensates for a substrate fall of 0-5% gradient to provide a perfectly level floor finish. It is also resistant to Australian weather and comes with a Fire Rating Certificate.